LIMA- In what appears to be a miracle, as many as 141 passengers managed to escaped unscathed after Peruvian Airlines plane bursts into flames midair here on Wednesday. According to reports, the Peruvian Airlines plane travelling from Lima landed after skidding off at the Francisco Carle Airport in Jauja. Images posted on social media showed plane catching fire. In a statement posted to Twitter, Peruvian Airlines said the plane turned off the runway upon landing at 4:30 p.m. local time. ‘All 141 passengers on board the Boeing aircraft were evacuated from the plane; none were considerably injured’ the airline said. Alberto Lopez, a spokesman for Peruvian Airlines, emphasized that the plane did not crash, though. ‘The investigators are traveling to Jauja tomorrow [Wednesday] at 5 am and our emergency team is in place and that is all we can say. 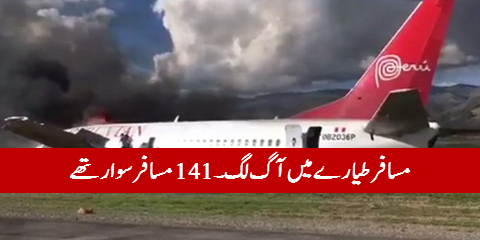 The plane did not crash, it landed and then the fire was produced once the plane was on the ground but the exact cause of fire will be explained once the investigation has been completed’ he said.